Anderson Valley Brewing Co – Pinchy Jeek Barl – Wow now this is a great pumpkin ale. Aged in bourbon barrels giving it that nice oaky boozy finish, but you can taste the crisp pumpkin notes in here for sure. Well done California, easy to mess that one up but this beer is one of a kind. Scuttlebutt Brewing Co – Ming the Merciless – I’m new to the IPA’s of the craft beer world, they were my last to warm up to, although had I tried this double IPA sooner I probably would have jumped ship sooner. Very nicely done on this limited release, love the subtle citrus notes. Laurelwood Public House & Brewery – Workhorse IPA – Another great IPA done by one of my fav craft beer cities, ahh Portland, such a fun-filled brewing city! Banded Peak Brewing Co – Plainsbreaker – Hopped up on this wheat ale! Wheats were my original go-to for beer because of smooth ones like this! Great flavor and so easy to pair it with something nice and crisp! Pretty Things Beer & Ale Project – Barbapapa – Haha what a great name for a beer and for a company. Love this one, stouts are a fav of mine, and although Imperials are a little too bitter and boozy for me, this one is fantastic. Although verrrry boozy, it’ll go down just right, pretty sure if you love Imperial Stouts this is your new best friend. Very excited about this one since it’s no longer in production, one of a kind! Evin Twin Brewing – Brett Yeast & Helles – Ahhh this is a great beer, lighter then the rest but still getting that kick straight from Brooklyn, a little musty and punches you for sure, me likey! The choices are the following with shipping included! Canada Only! 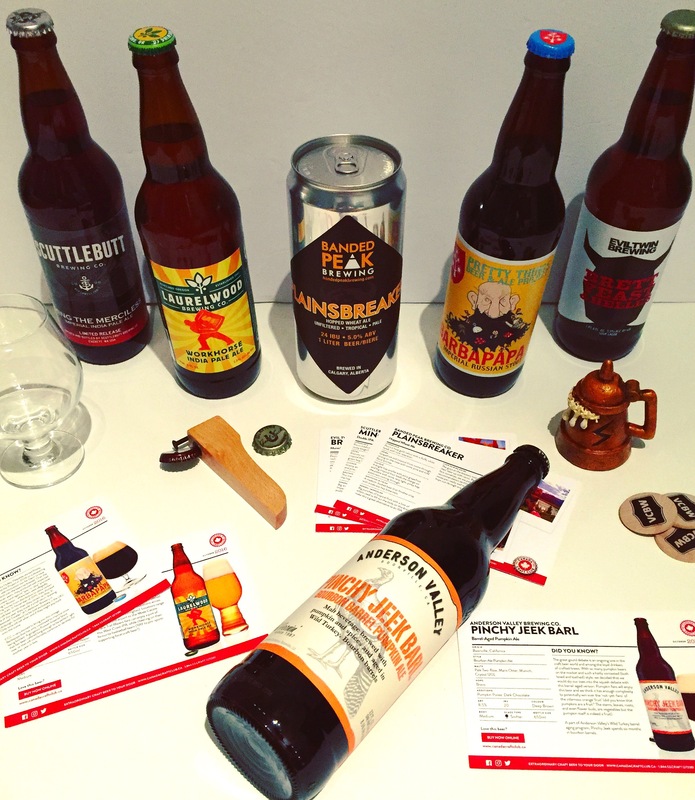 The bottles range from 650-750ml and include super rare and super unique beers from US, Canada and across the world to Europe! Looking for a gift or other type of package? There are SOOO many options! They have some awesome deals on now too, so the below prices get even better with tons of added fun stuff like bottle openers, coasters, toques and coupons! Super exciting that once your a member you get TONS of great deals too, so many amazing beers from past boxes for a special price, but only for members! WOOT! Craft Curious with 2 bottles for those just wanting to try it out – only $38.95. Craft Fan with 4 bottles for those wanting to try a new brew each week – only $61.95. Craft Geek with 6 bottles, there is no other way… just got for it! Only $96.95.